Dubai, UAE, December 04, 2018: Those who appreciate good design can be a tricky bunch to purchase festive gifts for as they have the most stylish homes that look like they’re straight out of a lifestyle magazine and certainly have a great eye for interior design. 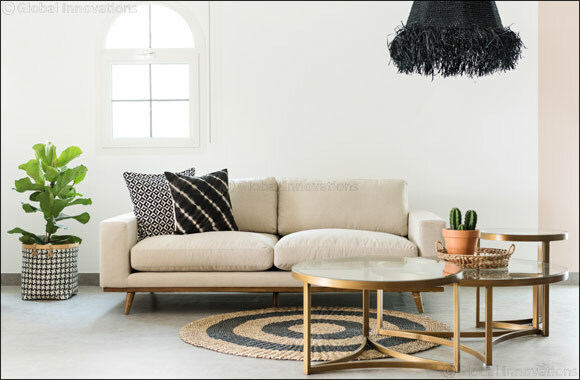 If you have a loved one or friend with a passion for home d�cor that has you stumped for gift ideas, then fear not as Home and Soul Dubai, the unique lifestyle retail concept store, has you covered with a huge array of options you can choose from this season. Founded and curated by Carol and Wael Sukkar, Home and Soul Dubai is a true ‘hidden gem’ found in leafy Jumeirah. Selling beautiful homewear, interior pieces, plants, gorgeous items for your kids, fashion and jewellery brands and its very own coffee shop Fiks - it’s the ultimate lifestyle destination for picking up your Christmas gifts this season. Interiors sourced from around the world and brought to Dubai with love, Home and Soul offers a won-derful selection of home gift ideas; from trendy sofas and chairs to chic mirror designs that are not only practical but they make a wonderful statement for the room – they will certainly bring a smile to your interior buddies’ faces on Christmas Day. This clean lined silhouette and soft beige colour way is a subtle addition to any home. It can be perfectly styled with all neutral colours or as the ideal backdrop for brightly coloured cushions. This modern and unique style adds that trendy feel to any home. Whether you opt for using this as an outdoor piece or as statement item in your living area, the Ibiza Wing Chair never fails to disappoint. This stylish console comes with a solid oak wood shelf, perfect for stacking magazines or props on. The cool de-sign adds a trendy nod to any home without taking away from other items in the room. Subtle in both colour and design, this simplistic style is a great addition to any home. You can either have it as a seating feature in a nook or a room or at the head of a dining table. Not only can this mirror be used to check yourself out in the mornings, it’s the perfect statement item to have in any room. Liven up your dining seating with the Lucie dining chair. The beautiful natural colour ensures it’s the ideal addition to your table d�cor. Home and Soul has also recently launched their festive decorations that can be purchased in store and online. From the prettiest baubles to elegant candle stands, each item will help you immerse yourself into a world of festive wonder. Situated on Al Wasl Road, Villa 6 , Dubai , between Um Al Shief and Al Manara, you can browse and buy online.